She LOVES BINGO!! 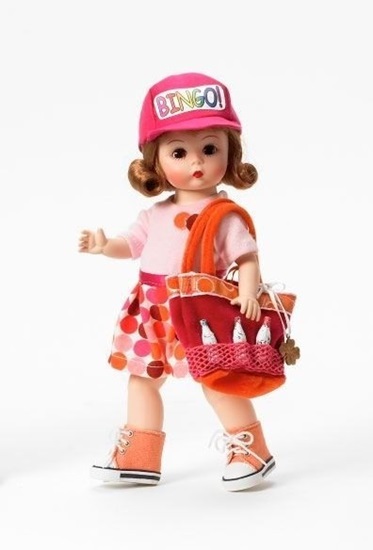 Ready to run to the next game, this 8-inch fully articulated Wendy is dressed in a white skort (skirt & shorts combo) with orange, rust, brown and fuchsia polka dots and a pink jersey blouse capped off by a raspberry pink baseball cap that has a bingo appliqué on the front. Orange high topped tennies and white socks adorn her feet and keep her ready to go! Her raspberry pink with orange trim tote is already packed with four magic markers in the pockets and her raspberry and orange cushion will be placed on her Bingo Parlor folding chair to soften her …'seat'. Just for luck of it she also has a cloverleaf charm on her bag. She has brown eyes and a taffy tan bang flip hairdo. She is perfect for ages 14 and up.